One of my favourite things about Canoeing in the Western Cape is all the places you visit and then get to see and experience from a different angle. During this time of the year the Canola Fields are blooming and the hills are all painted bright yellow. I love it. As for the race – Jeremy and I did well. We finished and had a lot of fun. We landed up in a tree and then in the water once when I hesitated which way to go (ooops). Otherwise, the weather was lovely, the river was full (which has it’s negatives), but overall, it makes the 75km go by much faster and be much more exciting. 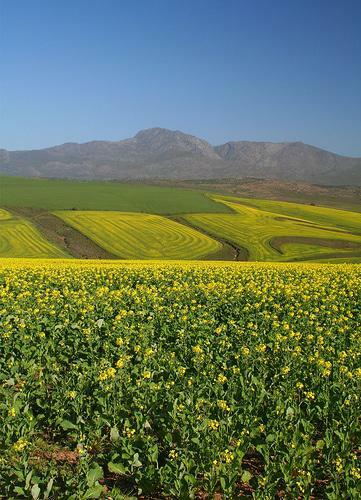 This entry was posted in Blog and tagged 2008, Breede River Canoe Marathon, Canola Fields, Western Cape. Congrats to your and Jeremy to your successful canoe race! 75 km by a canoe thatÂ´s a really long way! Your picture looks fantastic and itÂ´s a wonderful piece of the nature!Have a nice Monday!